Watch out all you fancy-schmancy, wine sippin’, zone cheatin’ Southern California gardeners—Zone 4 done got us a Yucca. Where it came from I have no idea. They hit the market a few years ago, and so far have passed our Frozen Tundra test without a problem. Look at it! 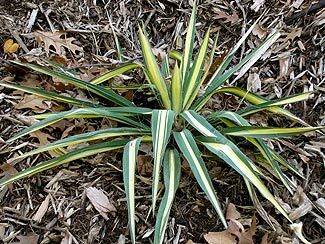 It looks like, well, a yucca, with splendid, variegated, sword-like foliage and a late summer bloom time to boot. Foliage grows slowly to 30” while creamy white, bell shaped flowers appear on very tall stalks (upwards to 72”!) in July and August. This species of Yucca flourishes in full sun but performs quite adequately in part shade. They will also tolerate full shade, though they will not bloom. Plants prefer slightly moist, well-drained, deep soils—they develop a whopper of a taproot. Once established, the taproot makes them difficult to dig and divide, but if you want more plants, do your darndest at digging up the thing anyway. Hack away until you get most of it. The following year, new Yuccas will appear, growing from the broken root segments that remained in the soil. Deadheading doesn’t appear to produce additional flowers on a stalk but seems to keep the stalks coming. It’s best to cut each stalk completely to the ground after flowering; the fruiting stalk is kind of ugly, then gets woody and persists through winter unless you deal with it. Use? Use them everywhere. Leaves are evergreen. The one pictured was planted a mere three weeks prior, towards the start of fall, so is not quite as sprightly and upright as it will appear next season. Mature leaves gradually fold over in half, while center growth stays upright. In winter, these center leaves pierce the snow, and are especially noticeable.